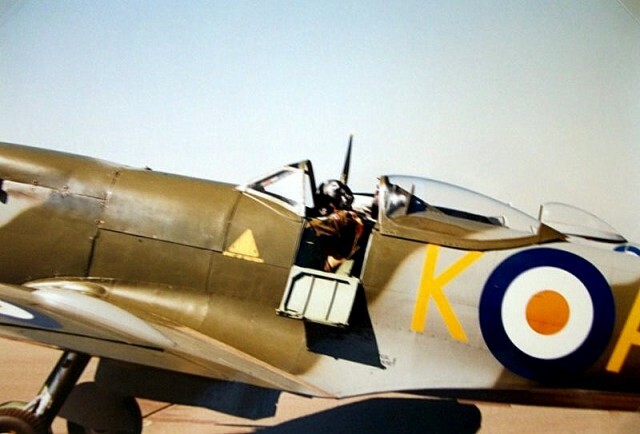 Ashes to Ashes, Dust to Dust – A Story of a Spitfire Sortie With a Difference! A Story of a Spitfire Sortie With a Difference! This is a story of one of the most bizarre and in a way “emotive” sorties that I flew, whilst serving as the 2IC of the SAAF Museum. Most of the Museum flying was in a way, emotional, normally exciting and often one of pride in the SAAF, it’s honourable history and all it stands for today. I have in this story, changed the names of people involved, for what should be obvious reasons. Also, accurate dates and times are not really relevant in this tale either. As the 2IC, one of my tasks was to manage the Museum open or flying days. These were great events, and attracted large crowds who would have a very enjoyable day, watching various flying displays, performed by well known display teams and some of the Museum aircraft, which always were a big draw card. In some instances however, gaps would open up in the program, either due to a certain team or aircraft type which could not participate due other commitments, or because we needed to change the program to allow different aircraft to take part and to avoid doing the “same old same old” every time. As such, I was working on a flying day program and ended up with an open slot. At some stage, a few days before the finalising of the program, a Mr Mitchell came to see me. He was the owner of a Pitts Special aircraft, and expressed an interest in taking part in the Museum Flying Day program. We were quite open to these requests, and indeed I was actually quite grateful for his offer, as I was still looking for a “slot filler”. My only slight reservation was the fact that the Pitts was a very well known machine and we had the usual Aerobatic Team Pitts formations already taking part. However, it was good he had volunteered, and we were happy to give people a chance to perform, which they might not necessarily normally get. As such however, strict guidelines were to be followed, to avoid any chance of “crowd euphoria” creeping in, leading to a smoking hole in the ground. These were, firstly, Mr Mitchell had to give me a written copy of the aerobatic sequence he was to fly. Then we briefed on height limitations, which in this case was 200 Ft AGL as a lower “box” limit. Other stipulations were, no crossing of the designated display line on the day. Manoeuvres done towards the crowd line were not permitted. Also knock it off parameters were discussed in that, should he attempt any manoeuvre not in his planned sequence, or was judged by the air show safety officer on the day, to have broken or would potentially break, the height and position parameters, he would be told to immediately “knock it off”, and land. Finally what was required was a flying demonstration of his sequence flown at a safe height, and if I was happy with his performance (from a safety and height control viewpoint), another practice at his planned actual sequence height. Mr Mitchell and I had a frank discussion about the regulations, and the reasoning behind them. Mr Mitchell was happy to comply with all the above requirements, and truth be told I found his attitude towards what we were doing here and the Museum safety guidelines, to be positive. Shortly after this we went out and demonstrated his sequence at height to me. After seeing his sequence, I was happy for him to step the height down, and he practiced another sequence. The Flying Day dawned, and a great day was had by all. At this stage, as I recall, the Spitfire was actually still having the new engine installed, and I flew a low level aerobatic display in the Museum “WATS” Harvard. It was one of my first displays and was very straight forward. I was still getting used to being much closer to the ground, and as such, was grateful for my experience of a few years previously, when I had taken part in the low level aerobatic competition held at the end of our flying instructor’s course at CFS Dunottar. Mr Mitchell flew a tidy display, and I recall thinking it was nice to see a simple, tidy Pitts sequence, a sort of ‘Shuttelworth-esq vintage” Pitts Special aerobatic display. I rather enjoyed meting Mr Mitchell and hoped he might once again be able to take part in a SAAF Museum Flying Day or, help us out if we needed some program slots filled. In this time the Spitfire was operational again with the new engine and some exciting times were spent on first flights and getting to know the aircraft, followed by displays and fly pasts. 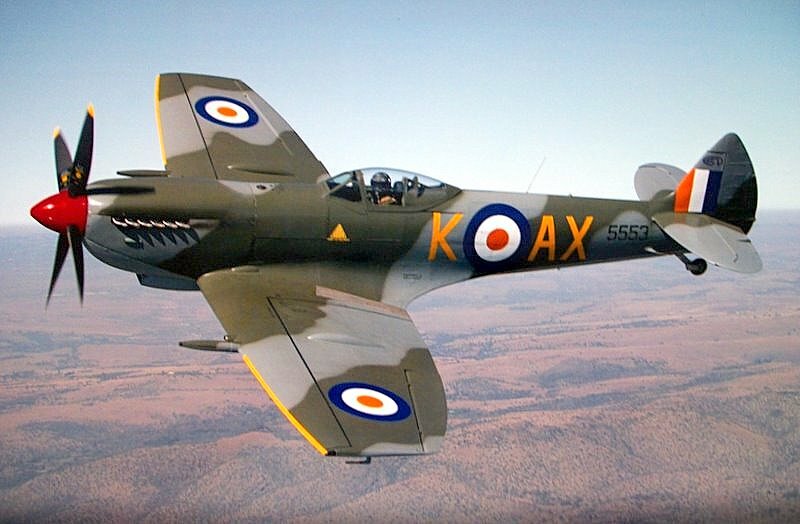 I have related my experiences on flying the Spitfire in another article. Suffice to say she in “flies as good as she looks”! Not to mention the historic significance of the Spitfire. One weekend, the South African Aerobatic Championships event was held. They were normally held at what was planned to be the new Durban Airport site at La Mercy, Kwa-Zulu Natal. But as I recall, this year, were held at a location in what was then Eastern Transvaal, now Mpumalanga. At the end of the event, aircraft were being flown back to home bases. As fate would have it on this and tragically on other past and future events, they ran into bad weather. “Get home-itis” is a well known illness which has and no doubt will still catch many. That next week, the newspapers reported that some aircraft returning from the SA Aerobatic Championships had crashed due to weather, with loss of life. I read with dismay that one of the pilots, who had been killed, was Mr Mitchell. My thoughts went back to another weekend a few years ago, when A great Ex SAAF pilot had been killed flying back from Richards Bay in atrocious weather, whilst conducting a charter flight from Lanseria. The tragedy of this, was I distinctly remember walking up to 41 Squadron hangar, I think the very next day. It was blue skies, horizon to horizon. So often with these, a single days wait or delay….. I was upset that the circumstances of weather and destination concerns had claimed yet more acquaintances. Little did I know, I was still to be involved. A few days later, The boss, Lt Col Neil Thomas, called me in to his office. I had met Neil Thomas on many occasions in my SAAF career and I was enjoying working for him at the Museum. We both have a love of vintage aircraft, and he was a dynamic and keen Museum OC. He told me that Mr Mitchells wife had been in to see him. I was a bit surprised, and was immediately reminded of the Aerobatic Championships tragedy. Niel had also got to know the Mitchells, during Mr Mitchell’s involvement in the flying day a few months previously. He told me that it had been a sad meeting. He then told me that he had agreed to a request from Mrs Mitchell. She had requested, that the Ashes of her husband, be flown in the Spitfire, to overhead the Mgaliesberg cable car top station platform, where she would be watching. She then requested the aircraft fly out over Hartebeespoort dam. And the ashes scattered over the dam from the Spitfire! He probably saw my expression, and added, well, how do you say “no”, to a woman whose husband did you a favour, and is now recently dead in tragic circumstances!? I must admit, he had a point. However, I immediately started to think of the realities, as I walked back to the office. The fact was if there’s one aircraft, in which you definitely don’t want loose articles in the cockpit, it’s the Spitfire! The cockpit has no floor or coverings. All the control runs comprising of cables and pushrods, are all exposed. Anything dropped would be irretrievable, unless you took the chance of rolling inverted, hoping it will fall onto the canopy! Having a loose ‘article” in that aircraft cockpit would be bad enough, but what would happen if “ash” went everywhere? Particularly, that kind of “ash”! It would probably be found in nooks and crannies for years! I spoke to some Technical staff, and was told in no uncertain terms that this “type” of ash was bad news! They said that this had been done out of a Harvard. It had swirled all through the cockpit as I recall, and they said it had, when streamed overboard, abraded the tail leading edge paintwork. I knew that the rear cockpit canopy of a Harvard, did tend to scoop air and it would travel to the front, to vent out the suction formed overhead the front canopy. As a pupil pilot, you hoped the Instructor hadn’t chosen the curried eggs on the mess menu, if you were up after lunch! The option of using the Harvard, and at least being able to have a “helper” in the rear cockpit – despite these unfortunate “ash” scattering characteristics, was not an option. Mrs Mitchell had especially asked the Spitfire be used! So like it or not, I was up for the task. It was fraught with disaster, of a diplomatic kind. Not to mention safety concerns. To overcome my mixed feelings – sympathetic to the request, tempered with annoyance with the practicalities, safety and choice of aircraft, I confess with apologies, I did harbour some dark thoughts of thinking, it was pretty extreme lengths to go, for a flip in the Spitfire! Humour, black as it was, has always been a SAAF hallmark, in interesting times! A few days later, Mr Mitchell’s ashes arrived in the morning, and were brought to my office. It was really rather sad, as I remembered a few months earlier, he had been in my office, having a pleasant conversation with me. Now, here was this small cardboard box, about the size of 1/3 of a cigarette packet carton. It was all a bit surreal. My first action was this. I had to see in what state the ashes were packed into the box. I didn’t need any surprises at 1000 Ft over Hartebeespoort dam, whilst flying one of the country’s most valuable historic aircraft! I had no choice, but to open the box, which felt a bit like grave desecration. I opened it a crack, rather tentatively, like there was a Black Mamba inside! I snapped it closed, once I saw to my relief, the ashes were packed into a sealed plastic bag. I thought, sorry, but they are staying in that plastic bag, regardless. I felt the risk of them flying about the cockpit and into my eyes no doubt, was too great. I reasoned that even if I did stream them from the cockpit, standing on the car viewing area, which was about two Kilometres or so away, Mrs Mitchell would probably not see that small ash stream, in any case. Satisfied with that, I got my thoughts together. I was scheduled to fly the sortie in the afternoon. After some thought, and discussions with “Mike and the Mechanics” (the Museum technical staff) I came up with the following plan. I would have no option but to carry the ashes, firmly tucked into my parachute harness. Nothing like keeping someone close to heart, I thought ruefully. This would allow me to get “easy” access to the ashes, and if they did slip or fall, I hoped I would feel it slipping and be able to do something about it. If it did fall, hopefully it would fall in my lap. Throwing the ashes out, I would slow down to below 150 MPH, safe speed to open the canopy and throw them, as hard as I could, horizontally but slightly downwards, to the right. This would be with the propeller slipstream and I hoped would take them down below the tail, with the slipstream and wing downwash. As a further precaution, just a second before I threw them, I would yaw the tail to the left, to get it out the way of any contact. The time to fly came and I walked out to the Spitfire. The SAAF Museum Spitfire was a Mk. IXe. Most would call it a Mk. XVI, but in this case, she did not have the Packard-built engine, but was a Rolls-Royce engined aircraft, and as such was a rare Mk. IX with the bubble canopy and clipped tips. 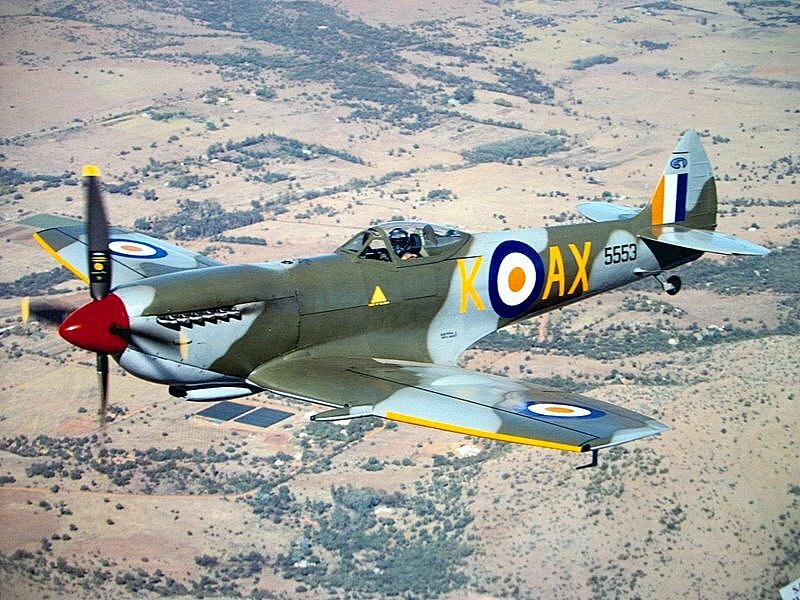 She was one of 134 Spitfires, gifted to the SAAF after the World War II in Europe ended. Granted, the clipped tips do detract from the elliptical beauty of the wing shape, but they do allow for an impressive roll rate at low level. The view from the bubble canopy is also vastly better than the conventional canopy, so wartime test pilots reported. So she stood there, in all her shark nosed glory, and she seemed to have some sympathy for me! We would be doing this together, and she was a team player. I don’t say that lightly. One of the endearing characteristics of the Spitfire is when you do some task, she seems to let you know she’s working with you. I know this sounds horribly patronising, but It’s true. Possibly because it’s such a pleasant aircraft to fly, so you need to devote very little capacity to fly it, whilst concentrating on the job at hand? I don’t know. After a pre flight I strapped into the cockpit and the Spitfire crew and I sorted out the securing of the ashes box. It settled snugly inside the parachute harness, and pressed against my chest, which felt a little creepy! I got busy with start up, and was kept busy with the whole process of getting to the runway. I did a final check on the box security, after line up, all seemed secure. Opening the throttle, the Merlin idle “snapple” rapidly changed to a roaring bellow. Bit of rudder helped by the take off full nose right, rudder trim, a tiny movement on the stick to hold the small visible section of spinner seen from the cockpit, on the horizon, and she smoothly lifted off at 100 MPH. I was off. As we got airborne I tried to reduce my upper body movement, as I retracted the gear and then closed the canopy. Winding off, of take off rudder trim was next and all was OK with primarily coolant temp’, (that’s the gauge you keep a close eye on!) and oil pressure was good. I was lost for a while in the thrill of being airborne in the Spitfire, and feeling the very light and powerful control column spade grip, under my right hand. We rapidly made our way to the Hartebeespoort dam area. The cable car, top viewing area was a large open round space, paved with local stone, and built quite close to the top station. It is also close to the Southern mountain edge, so as such has a clear and spectacular view, WSW, towards Hartebeespoort dam. Normally I would not be in a hurry to get there, in this aeroplane. But not today! I made a gentle low pass over the upper station viewing area, to announce my arrival as such. At first it looked deserted, but then I saw a lone figure standing there. I could see it was Mrs Mitchell. A gentle turn and I lined up with the dam and viewing area. I overflew Mrs Mitchell as she stood there, for the second time, proceeding to the dam. Once overhead, I slowed to 150 MPH. It looked clear below. I opened the canopy, glad to have the crank handle actuated bubble canopy on this Spitfire. I carefully levered the box out, into my left hand and with a gentle push on the right rudder pedal, yawed the Spitfire tail out the way, touch of opposite stick to keep wings level and I threw the whole box, as hard as I could, horizontally, downwards and to the right. In a flash it was gone. I flew on for a short while, closing the canopy. I yawed the tail left and right, slightly this time, whilst twisting my head around, to see any signs of a strike. I hadn’t heard or felt anything and what limited sections of the leading edges I could see, looked good. I then turned back to the cable car. On rolling out, I hoped Mrs Mitchell had seen the sudden first yaw, and realised its significance. Flying quickly back to the viewing area, I set 2000 RPM, and +6 boost, diving down to below the platform level. I set up for a run from east to west, roughly paralleling the Magaliesberg ridge line. Just before getting abeam I pulled up banking overhead the viewing area, as I crested the ridge. There stood Mrs Mitchell. A quick turn back to the south, and I made a low fast pass over the lone figure still standing there, North to South. As I flashed overhead, a short pause and I pulled up into an aileron roll. I felt relief it was over, with no horrible incidents! But somehow that feeling of relief, combined with the lone figure of Mrs Mitchell standing there, I suddenly felt undeniably emotional. She looked pretty forlorn standing there on that deserted viewing area. It was the final farewell to her husband, and here I was flying in an iconic aircraft, of course never having dreamt of this surreal situation when he had stood in my office, a few months earlier, chatting away. However, as I reached an early downwind position, I roughly shoved the thoughts out of my mind and cleared my eyesight. After all, I had to land this lovely beast, and that needed all my attention. I carried out the pre-landers, and set up on a turning base leg, throttling back as we reached half way to final. At this point, I selected flap and in response to the flap, the broad chord wings produced their significant nose down pitch, and she flew a lovely curved approach to roll out on short finals. Rolling out on final, we were close enough to see the runway either side of the long nose, which is the purpose of the curved approach, to see the runway during the whole approach. I rounded out, let her settle on the mains in a nose high attitude, before finally lowering the tail wheel to the ground. A bit of work on the rudder to keep straight and we were at taxi speed, after rolling out to the end of the runway. Taxi in and shutdown were routine and I carried out an after-flight, whilst answering curious questions about how it went! No, I didn’t tell anyone about my slight meltdown on early downwind. Till now that is!! Thus ended a strange, but memorable Museum Spitfire sortie. I have often wondered what happened to that cardboard box…? I hope that it opened up in the air, and its contents did scatter. Probably did, but the plastic bag may have stayed intact, but would surely have burst on hitting the water? All due respect to Mr Mitchell, but I had nightmarish thoughts of some poor boat fisherman getting a painfull smack on the head and instantly being covered in white-grey ash! Or some obscure Hartebeespoort fishing club house bar, having a strange cardboard box on display, amongst the “Klippies” bottles…. !